Laufen offers a superb combination of technical innovation and excellence with stunning designs from a range of leading designers at the top of their game. The pro S is the new member of the successful Laufen pro series. Thanks to the delicate redesign, the elegant pro S is compatible with all pro variants. Designed by the Swiss designer Peter Wirz, this range has a light and elegant appearance and is also functionally appealing. The aesthetics of Laufen pro S therefore definitely take the range in the direction of Laufen’s premium design lines while remaining affordable by all. 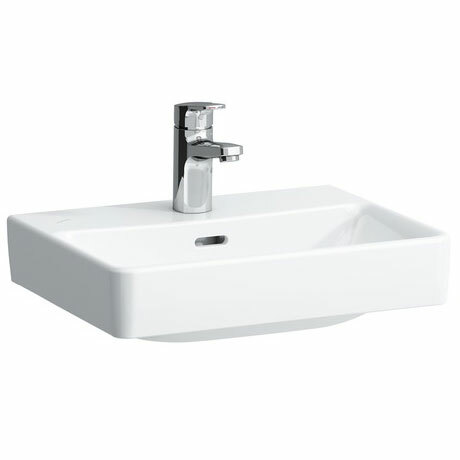 This Pro S 1 Tap Hole 450mm Small Basin with Ground Base is ideal for cloakrooms or small bathrooms and features a central tap hole with an integral overflow, its ground base means it is designed to be countertop mounted. Made from high quality vitreous china it is backed by Laufens 5 year guarantee.